EBook - "Everything you ever wanted to know about becoming a Helicopter Pilot!" The most comprehensive source of information available in one spot on how to become a Helicopter Pilot! As a longtime resident of Palm Beach County in South Florida, Kevin began his aviation career in the 90’s close to home and shortly after attended Embry-Riddle Aeronautical University. At the university, he earned a Bachelor of Science degree in Aeronautical Science and minored in Aviation Weather. Today, he has more than 4,000 hours of flight time, and is a dual rated pilot holding ATP, CFI / CFII, and AGI Certificates. Most of his flight experience has been built in the Northeast U.S., Southeast U.S., and Caribbean regions. Some of the flying missions in which he has participated include corporate transport, government/ military support, longline, sightseeing, charter, aerial photography, and serving as a Part 135 Check Airman. Some of the helicopters Kevin has flown include those of Aerospatiale, Agusta, Bell, Eurocopter, Robinson, and Sikorsky products. Lyn is a career helicopter pilot as well as a recruiter specific to the helicopter industry. He specializes in assisting helicopter operators in the hiring of Pilots, Mechanics, and Managers. With nearly 6000 hours of flying experience, Lyn currently holds an ATP/CFII Helicopter and is a Corporate Pilot flying an Agusta A109E in the Southeast, U.S. In addition to Corporate flying, Lyn has flown in several sectors of the helicopter industry to include ENG (News Gathering), Charter, Utility, Instruction, and a 5 year stint in EMS flying the Sikorsky S76C+. He is also a former U.S. Marine as well as serving 10 years in the Fire & Rescue Services where he retired as a Captain to enter a full time aviation career. Regarding Schedules: "Many helicopter companies use a shift type arrangement. Shift work in the helicopter industry came about to attract non local pilots and enable them to commute to their work locations. This commute may be a two hour drive or a commercial flight across the nation. Pilots may choose to commute, because the work location may not offer them a lifestyle that meets his or her needs. Common issues may include; high cost of living, remote locations, overseas, or locations that may not be suitable for raising a family. Common shifts could be a 7 day on, 7 day off rotation (7/7), or ........"
On Goal Setting: "If you seek a certain type of flying, you might use the stepping stone method to work your way up the ranks and become qualified for that mission. These are all questions that will shape the path toward the jobs that you will be seeking. The avenues are plenty, and the variety of helicopter jobs are numerous. An observation I have made is that much like a doctor, all pilots start out pretty much the same. However, as time goes on and we gain experience in specific areas, we each become technical specialists. These specialists with expertise in a particular flying mission might excel and spend an entire career flying that type of mission." "Right here is where is all begins. You in the cockpit, flying the machine you’ve been dreaming about for years. There are challenges ahead that will make you feel accomplished nearing completion. This is the process where your skills are formed and you will remember for ever. Let’s talk about some training related items you need to be familiar with. First, we wish to make it clear that this section of the EBook pertains to obtaining FAA Pilot Certificates and Ratings in the United States of America. Persons who obtain FAA Certificates (US citizen or not) may fly in another country, but only after completing a conversion process for the particular country. Some US flight schools are authorized to offer certificate conversions here in the USA as a part of their training." From relevent article in Chapter 14 titled, "Why you dont make any money!" "So that begs the question-should we really be making any more money for what we do? Have you ever looked at what you guys do for a living? Guiding a contraption that is nothing but a gas bomb surrounded by slashing blades that will disintegrate at the slightest contact down through holes in huge trees and among jagged rocks. Hovering over mountainous waves in a gale at night with a guy attached to you by a swinging cable, so far out in the ocean that you probably won’t have enough gas to get home. Scud running through towers, power lines, and notches in the hills with just enough vis for an “OH s**t” before you hit something, carrying somebody’s broken child in the back that’s dying by the second. Spending your entire workday shifting your concentration from instruments at three feet to the end of a 100' cable while using both hands and feet to maintain your position in the air, where just shutting your eyes for ten seconds to ease the strain would cause a violent, fatal, zillion dollar wreck. Doing twenty or thirty landings a day while poking around in the summertime soup that’s the GOM. I know you feel relatively safe, and even enjoy it some, but you have to look at it objectively. The U.S. Forest Service pays its firefighters 25% more for working around helicopters than for just fighting raging forest fires. The Emergency Services folks in the region where I flew EMS required that a fully staffed fire truck be present whenever a helicopter landed off an airport. That’s when I started asking myself “Am I a cross between Evel Knievel and the Lone Ranger?” If I am, then why is everybody else on the job making more money, and ......"
From relevent article in Chapter 14 titled, "The ins an outs of becoming a Firefighting Pilot"
Overtime. Relief Pilot or Primary Pilot? Is your overtime going to start at 40 hours/week or 8 hours/day? If you fly as a relief pilot and you work three 14 hour days, and then go on break or have to travel, you only get 2 hours of overtime. Because of that, relief pilots will generally charge a flat daily rate. If you are the primary pilot on the contract, you'll want the hourly rate plus overtime. You should be paid a flat daily rate consistent with what you would be making if you were flying a full time contract. At the end of the month, or the end of the season, you shouldn't be penalized for being a relief pilot. Some will say you should make more because of all the traveling you had to put up with. Others will insist that's what you get for being the new guy. From "How to choose a flight school"
"When discussing the aircraft utilized for flight training , three (3) areas of interest should be addressed. They are availability , maintenance , and insurance. The availability of aircraft for you to conduct your training is paramount. A good number of aircraft as a minimum is three (3). This will better allow for scheduled and unscheduled maintenance , a more flexible flight schedule , and a better idea of the maintenance practices of the training facility. This is not to say that a school with a single instructor and aircraft cannot provide quality training , only that in that situation a simple maintenance issue would have the potential of delaying your training schedule. The number of aircraft that a school operates should be based upon the student load of that facility." From "12 things every new career oriented pilot should know"
"So , what do you want? Money? To fly a certain Aircraft? Stability? Travel? Fly a certain mission....logging , EMS , corporate , SAR , ENG , combat? Be specific. I say this....I do not care what you want to do.....no matter how impossible it may seem or how impossible the naysayers say it is......YOU CAN DO, AND HAVE ANYTHING YOU WANT FROM THIS BUSINESS. That is a fact my friend. Do not let anyone tell you that because you begin flying an R22 that there is no way you will ever Captain a B412 EMS or a B430 Corporate or a BV107 slinging logs in some far way land or in an S76 screaming down an ILS to minimums somewhere in NYC. It can be done; all it takes is some patience, persistence, and a little knowledge." "Always , always remember...YOUR career is built upon YOUR reputation. In most cases , how you are to be perceived in this business rests on your shoulders. The piloting aspect is not what causes most problems for pilots. That part is easy for most of us. The problems usually come when the pilot has to speak or interact with coworkers or supervisors. All I can say is this (from a man standpoint)....when presented with a situation....think with your BRAINS and not your....."
Nearly 100 pages in length. What are the pre-requisites for becoming a helicopter pilot? Medical or legal disqualifications? Is there really a shortage of helicopter pilots? How much will flight training cost? How will I pay for flight training? What are the options? Do I need to fly airplanes before learning to fly helicopters? Where can I find lists of schools? Where can I find personal reviews or opinions on a particular flight school? How do I choose a flight school and an instructor? What about schools that claim to guarantee a job after training? What type of helicopters are used for training? Which helicopter should I use? What is life as a student pilot in training like? What is the employment outlook for helicopter pilots? What is the life of a helicopter pilot like? What kinds of schedules do helicopter pilots work? What jobs are available in the helicopter industry and where are they? How much can I expect to earn as a helicopter pilot? How quickly can I advance in my career as a helicopter pilot? What are traditional career paths for helicopter pilots? Thanks for the information that you provided in the book. I really found lots of good stuff in it and especially the "day in the life stuff". I am trying to make a life changing decision that is completely foreign to me and I would be giving up a "good job" that I make good money at to follow a life long dream that I have had. I was very concerned about the pay of course, but when it was put so well to me that you really never have to "work" another day in your life if you absolutely love what you do, it really hit home to me. I found that "Everything you ever wanted to know about becoming a helicopter pilot" thoroughly answered many of the questions I had initially. I had to make numerous phone inquiries with people in the helicopter industry to get my questions answered, but you have compiled all this information in a user-friendly, intuitive format. 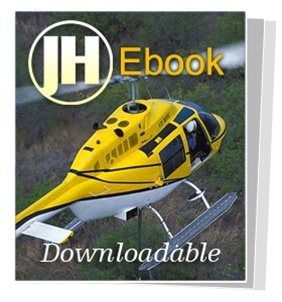 Your EBook also included many helpful web-links that I hadn’t found in my several years of research into flying helicopters professionally, especially the salary tables. I read it twice in it's entirety and several sections a couple more times and found the information was exactly what I wanted and even some things I didn't know I needed to know (Part 61 vs 141 schools for instance). I can't imagine what else you could add to make it more informative. Copyright © 2007 thehelicopterstore.com. All Rights Reserved.